One more happening quarter and one more issue of our newsletter. We ‘Make it Happen’ time and time again without any break. I guess ‘Make it Happen’ is second nature to women. No wonder our annual anniversary function on 24th April 2015 with ‘Make it Happen’ as the theme was a smashing success. Eminent speakers from the Government and industry were there to share their thoughts and experiences. Read more about it in this issue of our newsletter. Internet revolution has changed the world. The way we think, the way we do business, the way we communicate, everything has changed. While most of us take this for granted there are still a vast number of people who do not have access to the digital world. Digital India is an initiative of the Government of India to integrate the government departments and the people of India. This was launched with much fanfare by our Prime Minister. The STPI Chennai Office had organized a program as a sequel to this launch. Ms. Kalyani Narayanan our Past eWIT President spoke in this event. 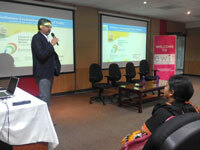 This newsletter covers the event and also the panel discussion on ‘Digital India and Indian Women’ organized by eWIT. We have covered many more such events in this edition of our newsletter. ‘Make it Happen’ was chosen as this year’s theme for the event keeping in line with the theme of International Women’s Day 2015.
eWIT brings women in IT and decision makers to a common platform to address challenges and aspirations of the women work force. With over 300 IT professionals both men and women along with eWIT partner organizations, the event was well attended. Organizations around the world have recognized the significance of diverse work force and gender equality. Women leaders are emerging across a broad spectrum of industries all over the world. While this is an encouraging sign, the World Economic forum cautions that the global gender gap will take another eight decadesto close. But this pace can increase if women across strata of every society decide to be the change agent to usher in this change. While one can see changes happening we also have a large population still caught in our age old cultural milieu. Our family centric society, value system, beliefs often times inhibit us from being open in a different way. Every career woman also carries the role of a homemaker. This dual role creates conflict at home and at work and makes several women relinquish opportunities which otherwise would have been there for their asking. How can the family and workplace contribute to make women take up these wasted opportunities? With this background ’Make it Happen’ the theme for this year’s eWIT celebration assumed greater significance. A galaxy of speakers shared their thoughts and experiences in an effort to motivate and inspire women to take up opportunities that are available for them in line with the theme ‘Make it Happen’. Ms. Lalitha Kumaramangalam - Chairperson, National Commission for Women, Govt. Of India was the Chief Guest of the event. 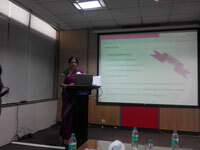 Ms. Anuradha Sriram, Co-Founder & Jt.MD, Integra Software Services Private Limited was the Guest of Honour. A lively panel discussion with three speakers of repute, Ms. M. Madhavi, Vice President, Hexaware Technologies, Mr. Sharad Verma, Global Head – Human Resources, Polaris Consulting & Services Limited and Ms. Sweta Jayaram, Vice President - Program Management , iNautix Technologies India Private Ltd. made the audience ponder over issues of women empowerment and the way to ‘Make it Happen’. This was followed by a Q & A session. eWIT Excellence Awards for the year 2015 was given away under several categories. An eWIT Souvenir was also released during the event. The Digital India week is a flagship programme of the Government of India which aims to digitally empower society and the knowledge economy. STPI conducted the Digital India celebrations in their Chennai Office on 5th July and eWIT was invited to participate in the same. Past eWIT President Ms. Kalyani Narayanan represented eWIT by speaking about the Digital India Initiative and the difference it can make in empowering women with quality education delivered digitally; she further reiterated that eWIT was committed and would be privileged to work with the government to make its Digital India Programme a grand success. In keeping with the Government’s Digital India Week celebrations, eWIT conducted a panel discussion on ‘Digital India and Indian Women’. The topics broadly dealt with during this discussion included entrepreneurship in the Digital World, the crux of the Government’s Digital India plan and how digitization benefits the student community. The director of STPI, Dr. Sanjay Tyagi introduced the PM’s Digital India Initiative. Sweta Jayaram (VP – iNautix) was the moderator of the session. Ms. Sarada Ramani (CEO - CI Computers), Ms. Indira J. (Director - Value Software) and Ms. Madhavi Chilla (Manager – HCL) formed the panel. 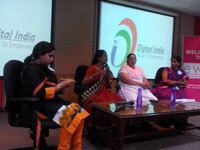 Women from the IT & ITES sectors and also representatives of various colleges formed a major part of the audience. The US consulate invited representatives from IT companies who are members of the Indo American Chamber of commerce to an informal discussion on “Recruitment, Retention and Reward “. The invite was from Anjana Chatterjee, Political/Economic Specialist, U.S. Consulate General, Chennai. The intent of the discussion was to understand the strengths and challenges faced by women as opposed to men across IT companies. The discussion took place at Lloyds Tea House and the US consulate was represented by Samuel F. Rothenberg, who is the Political / Economic officer along with Anjana Chatterjee. The highlight of the discussions were on the reduced number of women in leadership roles in the corporate world and what the corporates were doing to address this issue. Although this issue is global the meeting focused on Indian women and challenges faced by them in attaining senior roles. Responses from the IT companies represented indicated that the various reasons for women not to choose leadership positions were more social and personal in nature like women getting married and opting not to take responsible positions in order to balance their personal and work life, lack of support from family, pressure for the wife to give up employment when the husband has to relocate due to a transfer etc. In India the social aspect is very dominant like it is not acceptable for a woman to come home late from work. Even if the family is supportive, this would be frowned upon by neighbors, friends, extended family etc. and this would matter a lot for the family. Another aspect is childbirth. This could be at the time of maternity leave where the woman employee would like to take a break for a few years to take care of the child. In India bringing up of the child is considered to be a woman’s responsibility and between the husband and wife, the wife is expected to sacrifice her career. Samuel questioned the measures that each company was adopting to counter the above issues. The participants said that work- from- home option is given to women employees working in certain departments. The other measures offered were flexible timings for mothers of young children to be home before their child returns home from school. In some of the companies, mentors were assigned to a group of women to guide and offer advice on specific issues that these women were facing and also to represent their needs to the management. It was concluded that unless the management and senior leaders in the organization orient themselves specifically to retain and reward women to rejoin after a break, it would not be possible to increase the number of women in the organization. On behalf of IACC, Ms Chatterjee said that they would be engaging more member companies in this kind of dialogue and share the best practices followed by companies with all others. Following this report certain issues regarding women in all sectors, the present status and action plan is being submitted to Ministry of Women and Child welfare. The Southern Regional Consultation was held at the University of Madras, Guindy campus on 22nd July. eWIT members - Jayalakshmi Thirugnanam (Joint Secretary) and Indira J. (Founding Member) attended the meeting and presented the recommendations for empowerment and retention of women in IT. Some recommendations such as procuring IT projects by women entrepreneurs was well taken and marked for action.